We realize we’re paranoid and not in the world-is-ending-cult sort of way, but more in the heliophobic (fear of the sun) way. Mind you, we’re not at the stage of being committed – well, not yet – but our ongoing search for that one perfect sunscreen is kind of an arduous task. This Skinceuticals sunscreen comes so close to perfection that we always keep it stocked in our anti-aging product arsenal. Although you may question the affordability, the bottle goes a long way, usually taking us 3 months to finish, coming in at about $8 a month which isn’t too crazy. 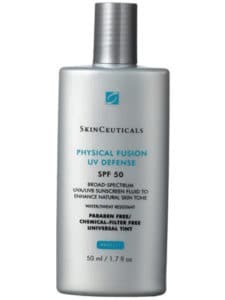 The formula offers a superior level of protection from both the aging and burning effects of the suns rays through 6% Titanium Dioxide and 5% Zinc Oxide, and also comes in a universal tint that helps cover the ghost face situation that many mineral sunscreens seem to bring. As you might know, we are big fans of physical sunscreens that use minerals that sit on the skin and reflect the suns rays rather than chemical sun protection agents that are absorbed into the skin. The one thing we’d love to see in this Skinceuticals sunscreen is more sun protection boosting antioxidants (like Vitamin C). Either way we make sure to get our daily intake of antioxidents through applying certain facial vitamins serums that are particularly effective when applied topically. If you’re interested in learning more about sun protection be sure to read our in-depth guide about the benefits of an effective sunscreen that not only covers how they work but also ingredients to look out for.